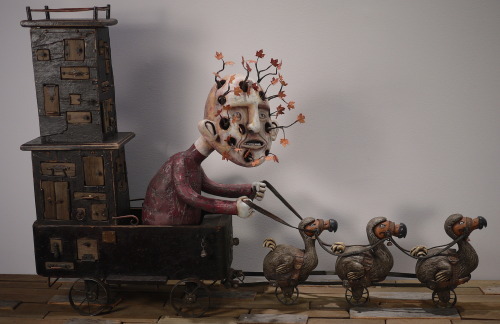 Kevin Titzer is a sculptor of fantastically intricate wood and metal figures that inhabit a cobbled together world of Dodo chariots, macabre dentistry, and archaic flight machines. 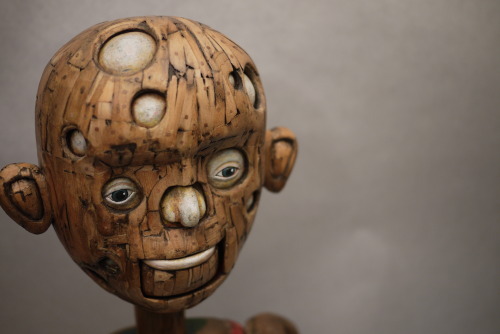 Most of his sculptures have darkly comic undertones with either madly smiling or apathetic faces. His incredibly highly individualized work seems as if it could be from any century. 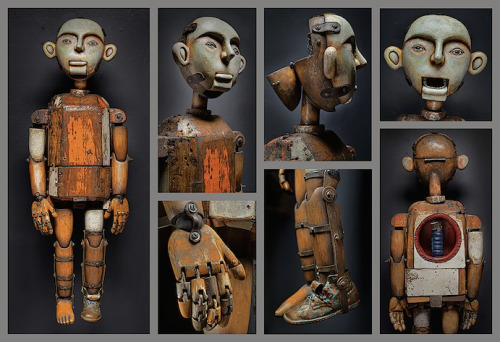 Using found objects, often antique, and his own hand-crafted elements gives his work a unique presence. 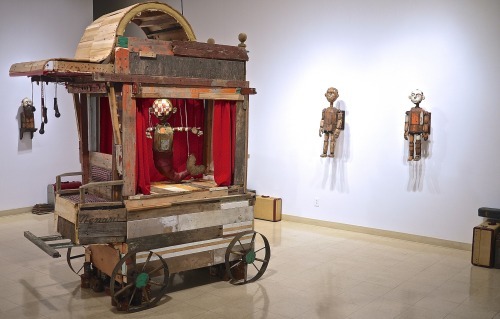 This anachronism drives the viewer to imagine enigmatic and engaging narratives. 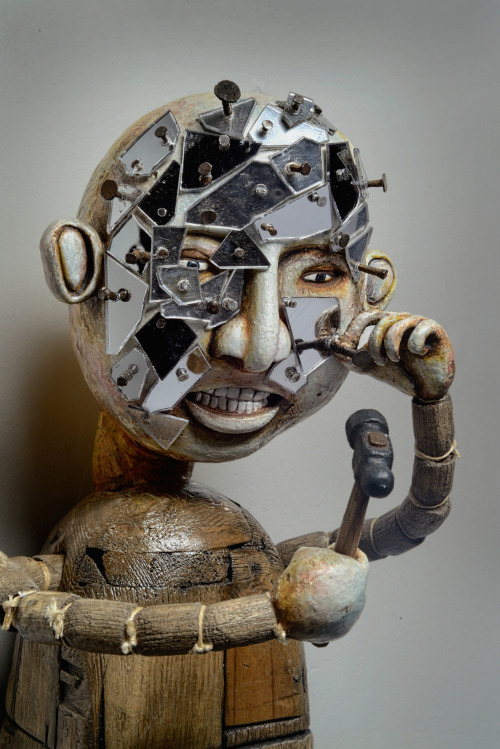 He has exhibited his sculptures across the US and internationally. 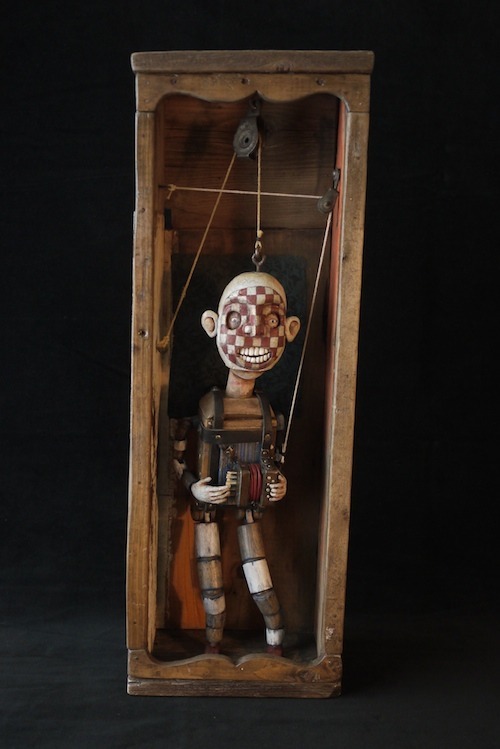 Recently, I had a correspondence with Kevin as he prepared for his September exhibition at Stranger Factory titled “Peccadilloes”. You’ve been doing a lot of traveling lately. I know that you saw some artwork on your travels, what was something that you saw that astounded you? I recently got to see my first Hieronymus Bosch painting in person. That was pretty exciting. I geeked out a bit and had my girlfriend take about eight photos of me with it. I also visited some mind blowing architecture. It was at a amazing place called the Convento de Cristo. Additions continually added to the building from the 1400’s to the early 1600’s. So it’s this wild blend of all these different architectural styles and techniques all smashed together. It was like a medieval version of the Winchester House and Willy Wonka’s factory carved out of stone. I think it’s become one of my favourite places I’ve ever been. Let’s talk about your own work. Tell me what you’re working on at the moment. Ventriloquist dummies and prosthetic limbs are two things I’ve been experimenting with lately. Some of them are in my current solo show titled Sous Une Mer Detoiles. 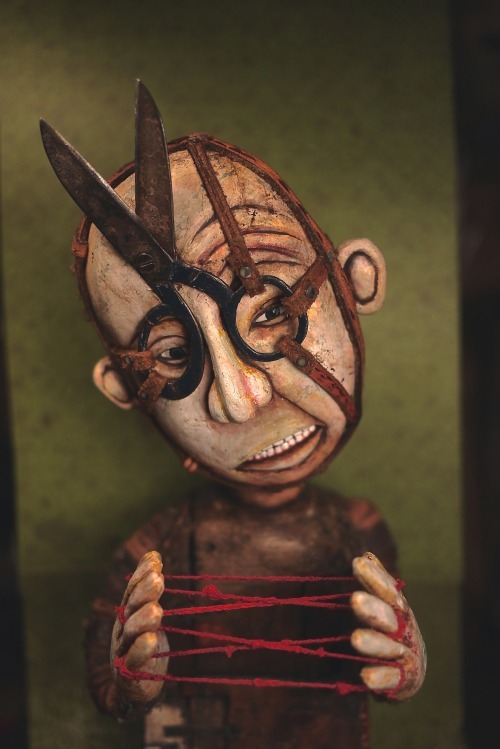 It’s in conjunction with the Festival International Des Arts De La Marionnette here in Quebec. Actual usable ventriloquist dummies? That seems to lead into a different direction with your work. One that involves a direct and physical interaction with the viewer. Yes? What are some of the ideas your thinking about with this new work? There’s two functional ventriloquist dummies in the show. The heads turn and the mouths can open and shut. With these first couple I didn’t even try to build the mechanics to make the eyes blink. It’s all pretty simple engineering, but it’s been a challenge. I usually only need to make things look like they move or might have at one time. So yes, some of the work in this show is a bit of a new direction for me in a technical way as well as thematically. In the past, I’ve often tried to imply a moment right before of after something happens. By making something that people interact with, I guess this is the first time I’ve made something that is taking place in the present. The show wasn’t planned that way, but I guess it makes sense to me now. As this batch of work has come together, I’ve slowly realized that many of these pieces are about my relocation to Quebec. It’s a really interesting concept to hand craft a prosthetic limb when an actual prosthetic, I assume, is made mechanically with medical precision. Yeah, I really like that contrast. Although, I’ve been more interested in prosthetics from the past. When they were a little rough around the edges and people were still figuring out what worked best. That was the jumping off point, but I didn’t want to just reproduce antique prosthetics. Nothing I’m making could feasibly be used by anyone. I didn’t want to take too much artistic licence where they begin to look overly fantastical. It’s been a fine line to make them seem realistic enough, but also integrate unorthodox design elements that might suggest something about the person who theoretically used it. It’s been an interesting problem to play with and a ongoing process to do it better. Your work is meticulous and extremely well crafted. How much planning or design goes into what you do? Is it possible to explain your process? I usually have a general idea of where I’m going. I don’t know if I can explain my process very well. It’s probably messier than you’d expect. Things end up veering off to places I don’t anticipate and I’m often readjusting and improvising a lot . Those seem like the best places to be. I would suggest that your work gravitates towards those unknown places. This is what attracts me to your work. Thank you very much, Doug. Your skill seems effortless and looks as if they were made by strategic purposeful design-yet, when looked at even closer, there are bits of keys, old nails, scissors, etc. all things that you’ve re-purposed. You use a lot of found materials in your sculptures. I’m curious if you find a tiny scrap of metal and build around that or vice versa? It’s very kind of you to say, but effortless is not a word I’d ever choose to describe my studio skills. I think what I do is like sausage. If you’re into that sort of thing, just enjoy it. You’re better off not knowing how it’s made. That said. For the most part I don’t start with the materials. The pieces never seem to flow very well and to me usually looked forced. Most of them never make it out of the studio. Can you tell me about a time when you were younger (maybe even a child) and you knew you were going to be an artist? It never occurred to me when I was younger. “Artist” as something you became wasn’t at all in the spectrum. I might as well as had said, “I’m going to grow up and become a unicorn!” Just kind of backed into it I suppose. I come from a family who all work with their hands and are good with tools. So that aspect of it always felt familiar. Actually, I think it’s only been in the last four or five years that I’ve been almost comfortable referring to myself as an artist at all. Does Subway still refer to their employees as “Sandwich Artists”? Ha! I would argue that a Subway “Sandwich Artist” does a very specific type of performance art. To me, your work seems to consist of scenes from short stories/vignettes involving characters that have found themselves in a dilemma or a circumstance that although darkly comic, can be imagined as having disastrous results. Do you think of yourself as a storyteller? I don’t think so anymore. Although I’ve described myself or been described in that way in the past. At the end of the day, I’m just setting up little fragments that have been rattling around in my head. It’s the viewer who constructs the stories with them. I’m just an instigator. Indeed, humans are inquisitive and need to find reason when faced with something unknown. What inspires the “fragments” in your head? Yes that’s it. We’re always looking for connections and patterns. I enjoy trying to figure out why seemingly unrelated elements have been put together. Things I have to puzzle out and that I’ll never know the full story. Although, lot’s of people aren’t comfortable with open ended things. It’s not very satisfying for them when I say I don’t exactly know where the fragments come from. I think most of it is subconscious and the things that aren’t are things I’m worried about at the time. Or any number of other things. It’s a jumble. For me, I guess physically building it is a way of making sense of it all. Douglas Miller is an artist based in Louisville KY.
You can catch more of Kevin’s work here.